Warning: This post gonna be long. It's Saturday today and I decided not to go out as I have so many backdated posts that I need to update in the blog. Alex, the wwoofer from France went to Jeju-si last night for a drink and has not returned yet. Maybe he got wasted there and no one wakes him up..hehe. June, the wwoofer from HongKong went out early to check out the Ollegil Festival at Route 9 near Sanbangsan. Sorry readers, cause I have very limited internet access to update the blog daily and as recent as possible. It will be loads of backdated posts. Bear with me. 고맙습니다. I think that the best way to explore Jeju Island is by renting a car. There are so many Koreans from Seoul that I met in Jeju Island and they came for hiking for 3 or 2 days, rented a car and exhaustively visit as many scenic spots as possible. Foreigners must have international driving license to drive in Jeju Island. You may check here to rent a car. I will cover more about car or bike rental how-to in Jeju Island in another post later. 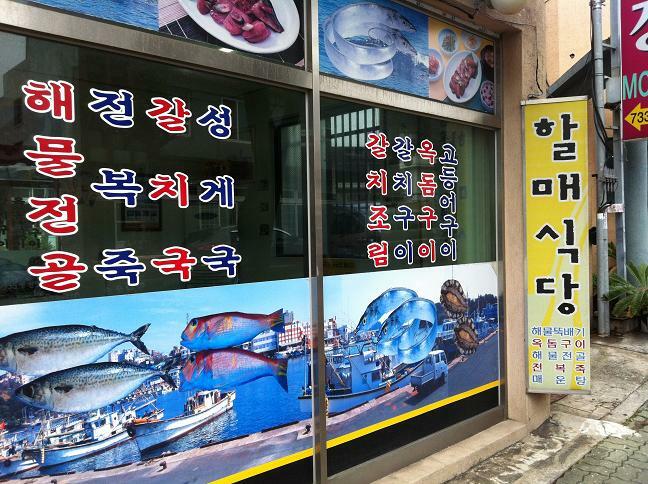 Jeju Islanders speak in dialec or we call it 'saturi' 사투리. I could comprehend very little and thanks to my new found Jeju Island father..hehe, I learned a few words or two. He was very kind to even write me a list of 제주도 사투리 words. It's really interesting to hear them speak the dialect, like music to my ears. If given the situation in Malaysia, chocolate would be my last option. I don't really adore chocolate and I seldom binge on them. By seldom I mean maybe once in 2-3 months? ^^ But..I did bring some from Malaysia cause I have learned a point from my good friend Hanim. When we went wwoofing together, she couldn't stomach too much Korean food very early in the morning. So I told her to bring Cloud9 chocolate in 30's mini packet just for that extra energy. I did exactly the same now. Just when I feel like I don't want to have rice for the day. Ahh..I wish I brought more socks but I left many at Min Young's home before I went to Jeju Island. Walking around the Ollegil course has suffered my poor feet and they stink after a hard day walk hehe..I think everyone who visit Jeju Island must must must try Ollegil walking course. The walk along the course is magnificent. Subhanallah. Try Ollegil course 9 and 10! Don't forget extra socks and muscle relaxant oil or cream. 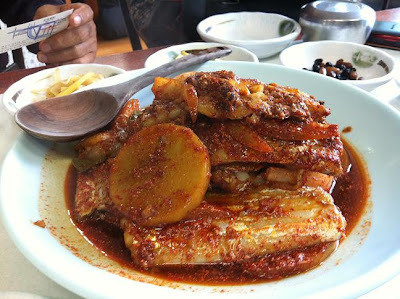 Jeju Island is famous for seafood and black pig. As I can't eat pork so I tried seafood. You must try '조림' pronounced as 'jorim'. It's pretty similar like our 'asam pedas' but definitely not the same. I tried '갈치 조림' pronounced as 'galchi jorim'. Since I have very limited cooking experience so I couldn't recognize the fish. Tutie said it might be 'ikan parang'. Acha said it might be 'ikan cermin'. Which is which? the real name of this fish in English or Malay? 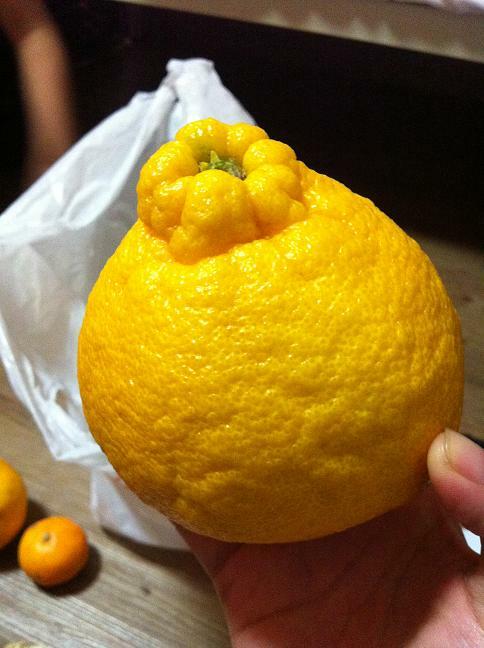 And..Jeju Island is famous for none other than *drum roll* tangerine﻿! Some readers dream to pick tangerines at the ubiquitous farm around the island but I'm not pretty sure which farm actually offers that. I did ask my host but he told me, right now, they are picking the best quality tangerines for sale and they could not offer that. FYI, tangerines has many varieties and the one that are sold now is harvested during November to somewhere mid January. Then, they will start harvesting another type of tangerine called Hallabong. The best Hallabong will be harvested in January and February. Now it cost a bomb for one but in February it will be cheaper...around 2,000 to 3,000 won a piece. I'm hungry!! So, till next time..aja aja fighting!! Oh..I will be coming back to Seoul on Nov, 15th. Initially I'm thinking that I want to experience the 12 hours, night ferry to Busan which cost about 30,000 won but at the last minute, I managed to grab a flight worth the same to Gimpo and there are so many stuff to resolve in Seoul that force me to return.